After trying this bread at Gastro Sentral Kuala Lumpur, I loved it so much and asked for the recipe from the Executive Chef. He was extremely kind to share the recipe with me. I didn’t think it was right to share the recipe publicly, so I have modified the ingredients to suite a home baker. 1. Add all ingredients into the bowl of stand mixer, first the wet ingredients (milk, cream, egg, olive oil, tangzhong, pesto), then followed by the dry ingredients (yeast, sugar, milk powder, bread flour, chopped black olive, emmental cheese, dried rosemary) and salt last. Knead until the dough is smooth and elastic. It takes around 10 to 15 minutes. 2. Then let the dough complete the 1st round of proofing, about 45 minutes until double in size. 3. Mix all ingredients for filling in a bowl. 4. Transfer dough onto a clean floured surface. 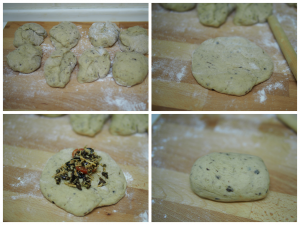 - Divide dough into 8 equal portions. - Roll the dough into balls. - Use rolling pin to flatten the dough. 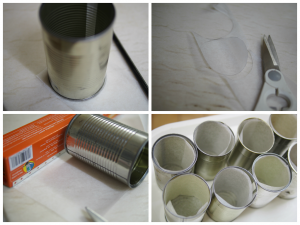 - Stuff with filling then seal it and shape into an oval that would fit in the can. 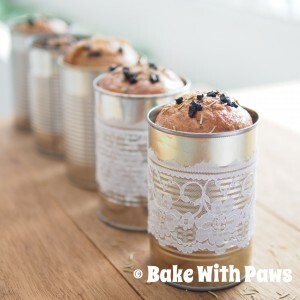 - Place dough in the cans lined with non-stick baking sheets. 5. Leave to rise for another 45-60 minutes or until double in size. 6. 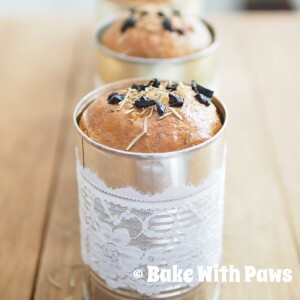 Before putting the bread in the oven, gently brush the balance of whisked egg on top and sprinkle with sea salt, chopped black olive and dried rosemary. 7. Bake in a pre-heated 190C oven for 30 minutes, until the bread turns brown. 8. 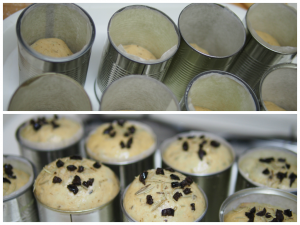 Remove from the oven and let cool for 5 minutes before removing from the can to cool on a wire rack. This is important so the bread doesn’t get soggy in the can. Remove the non stick baking paper from can. Once the bread has cooled you may put the bread back into the can to serve. I made 8 cans of bread from this recipe. It should probably be 7 portions only so that the tops of the bread would over flow slightly from the can and look more presentable.